Don't have a mental break down, take a break with BreakMentalDown. Updates on insanity, nachos, mini putt putt, more nachos and awesomeness every Monday and Thursday. The "Legends of the Hidden Temple brought back with 5,000,000 fans" group has surpassed 50 fans, putting the beloved game show 1/100,000th of the way to making history. As encouragement for this splendid cause, I am reprinting the press release as a show of support. Earlier today, Nickelodeon launched a Facebook campaign to gauge interest in a reboot for the big-giant-head-hosted-series. Fans of the show can register and like the campaign at http://on.fb.me/LegendsHidden. The campaign looks to garner five million fans before the network will consider letting Olmec rise from his storage-closety doom. 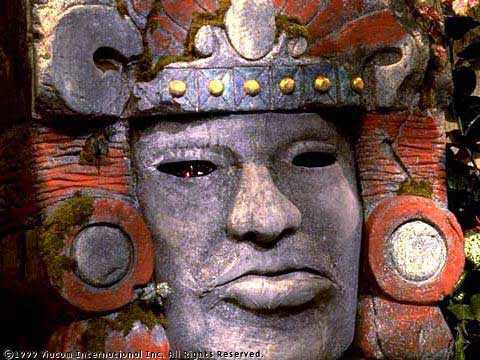 The series, which ran on Nickelodeon from 1993 to 1995 developed a cult following for its frank depiction of Olmec, its big-giant-head of a host as well as idiotic kids who could not figure out how to put together a three-part monkey statue. It won a CableACE award for Best Game Show in 1995. Although the series only lasted three seasons, to this day it remains a popular fixture on college campuses and at Halloween parties. “To bring kids the ability to rediscover the Comet-Embroidered Battle Flag of William the Conquerer or the Milk Bucket of Freydis truly makes me ecstatic,” says Fogg, referencing two of the more renowned episodes from the original run. Even the potential of bringing the show back has resulted in more trouble than getting out of the troubling “Shrine of the Silver Monkey.” Nickelodeon initially balked at the high salary demands of the famed big giant head and co-host, Olmec, but the show's producers found ways to reason with the network. Nickelodeon, now in its 32nd year, is the number-one entertainment brand for kids. It has built a diverse, global business by putting kids first in everything it does. It's most known for never engaging in Facebook ruses, no matter the legends that could be unearthed by it. Nickelodeon's U.S. television network is seen in more than 100 million households and has been the number-one-rated basic cable network for 16 consecutive years. For more information or artwork, visit http://www.nickpress.com. Nickelodeon and all related titles, characters and logos are trademarks of Viacom Inc. (NYSE: VIA, VIA.B). I am a writer, publicist and full time retail employee. I enjoy stuff a great deal. Check in every Monday and Thursday for updates, ramblings, insane borscht recipes and compliments about my cats.